Automatic updates are available as new features are added. Your installation can be configured to automatically check the web for updates and upgrades and automatically install them, keeping you on the cutting edge of controller technology. There is not an additional charge for these upgrades. Tech support and diagnostic troubleshooting can be done anywhere in the world that has an internet connection. Control of the machine can be handed over to the technician and multiple diagnostic tools are built in. A standard web cam means you can get help face to face over the web. 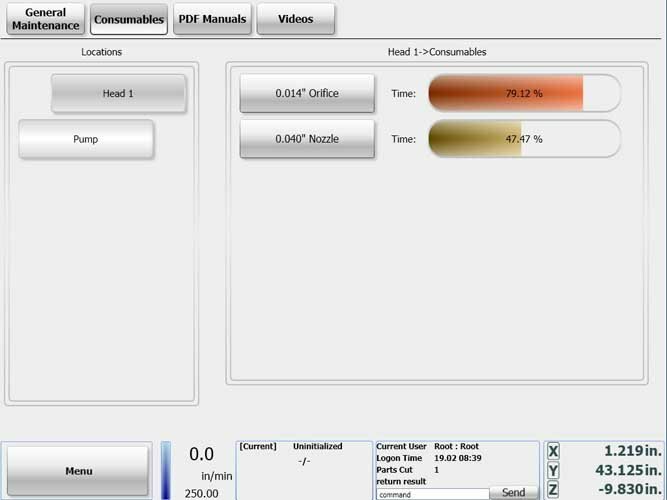 Use our PDA outfitted with Windows Mobile 6 and our easy to use pendant software. It communicates via Bluetooth and WiFi and gives the ability to jog the machine, start and stop parts, as well as feedback on the shape of your part and the amount of time left to cut - all from your office or couch at home! 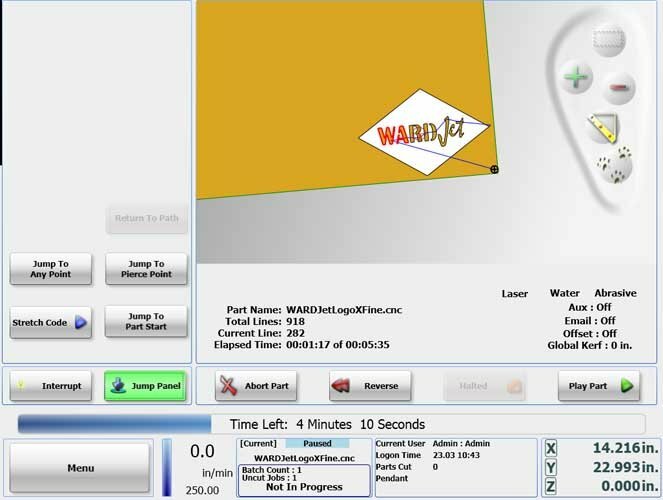 A variety of consumable items can be tracked in real-time on the controller. Each consumable is linked to a certain machine action and calculated by time, cycles, or both. 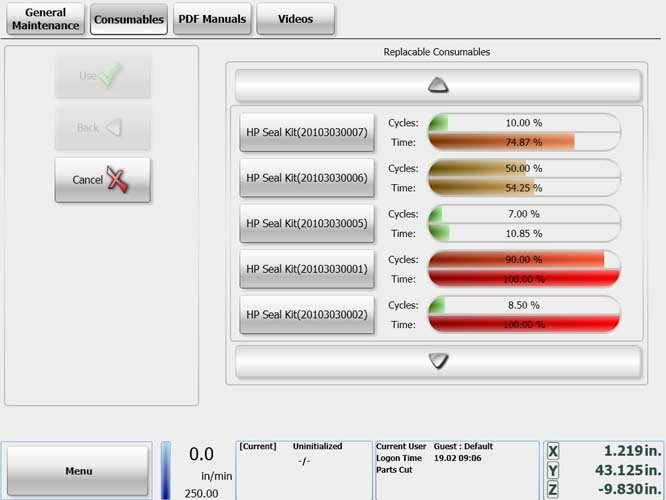 Now you can get accurate information about the life of your consumable, as well as do efficient preventative maintenance without wasting time or materials. The number of independent consumables that can be tracked is not limited. The controller accepts standard G-Code parts, so you're not locked into any specific software package to create parts for your machine. You can use the default M codes to cycle outputs on or off. 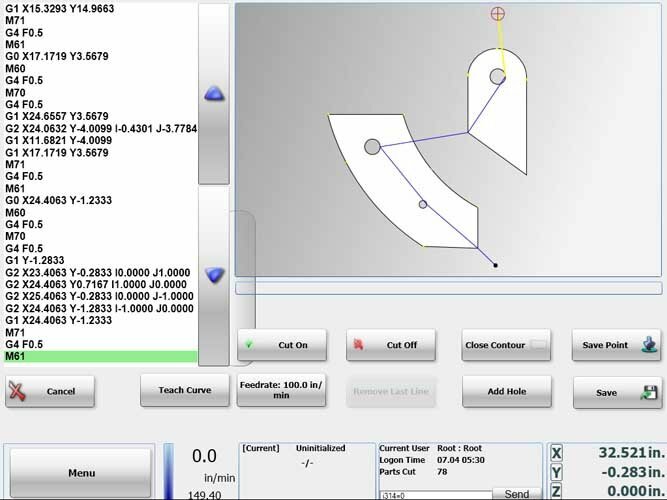 If you prefer to use the standard G+M codes from your current CAM software or another waterjet, you can use the built in translation files. These allow you to run existing code without having to post-process them again. Squareness of a gantry system is critical to cutting accurate parts. The XL Controller ensures squareness off of two independent home switches on the gantry axes. At the end of each homing cycle, the gantry axes are realigned to their calibrated state. From that time on, the system is continuously monitoring the travel of the motors. The operator is notified on-screen if the gantry motors ever become misaligned. As part programs are loaded into the controller the G-Code is analyzed to get a time estimate. While a part cuts, the total time remaining is displayed, along with a progress bar that fills up as you cut. This information is available anywhere that you go throughout the program and on the PDA wireless pendant, so you'll always know when a part is about to finish. The controller can be configured to send out e-mail notification after the completion of a part. It ties into your facilities e-mail server, or acts as its own server. E-mails include an image of the part that was cut, along with who cut it and the amount of time it took to cut. Reverse function. Trace back through the program to recut a portion of your part. Reverse will trace back an unlimited amount. Each user receives a unique password, and can be put into one of three user levels (Operator, Power Operator or Administrator). Each user level can have its permissions easily changed by an administrator. 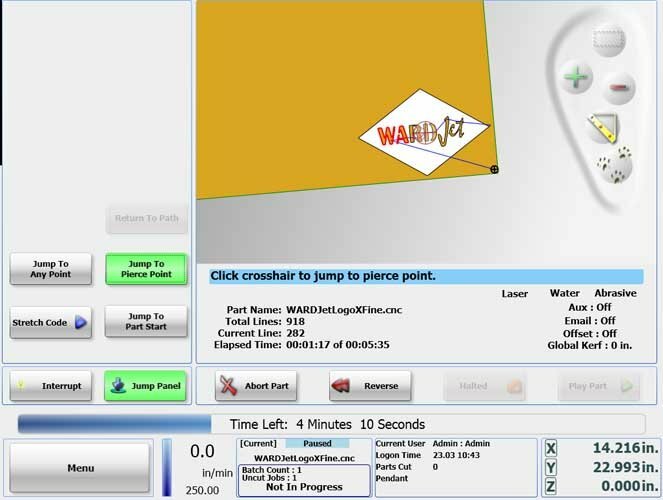 The ability to add/remove part programs, edit part programs, enter maintenance information, change parameters, etc. can be adjusted, to allow your operators as much or as little freedom as you wish. While logged in, the program tracks how many parts were cut, what maintenance was done, and what faults occurred for a given user. All of this data is logged into a text file. Pierce point mode allows you to select the beginning of a contour by touching the screen near the point where you want to start. The program will execute from this point. Start a program anywhere by simply touching the part on the touch screen at the location you wish to start cutting. You can also enter absolute or incremental data and co-ordinates. To cut large parts (e.g. 20'x10' on a 6'x13' table). Cut the first portion of part program, move material, easily pick up the position of next program and cut! 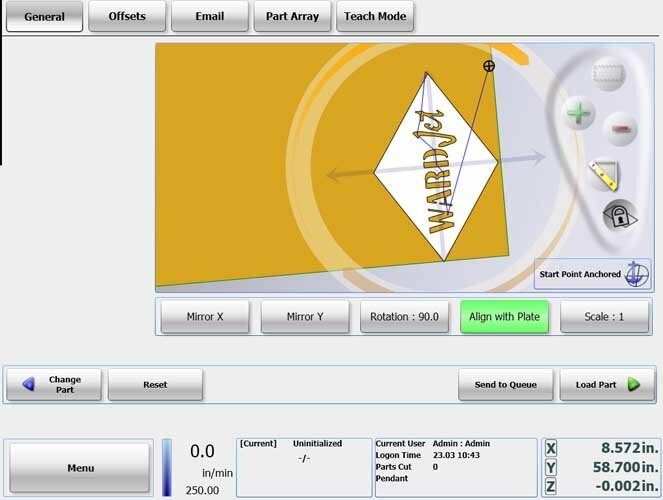 Touch the screen near the geometry where you want to start cutting. Part cutting will resume cutting near the point selected on screen. 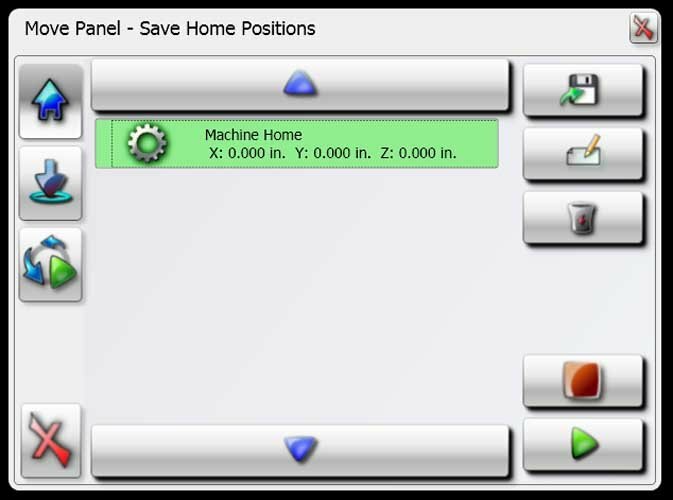 Using the built-in "Teach" mode, the machine can be used as a digitizer the size of the waterjet table. Just use the controller's jog controls to "trace" your template, point by point, to create CNC files right at the controller! Drawing curves and lines are fast and simple - no need to use CAD/CAM software.